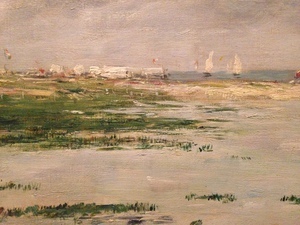 Suspension, one of the time-qualities a painter may achieve, is particularly pronounced in Boudin’s Low Tide at Deauville. 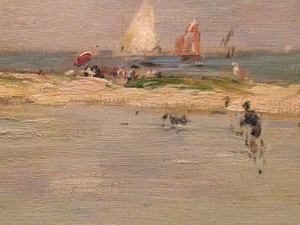 Sky over the land, figures near and in the water, boats awaiting the wind. Just at low tide there is a pause, the water holds steady, and then it’s as if the whole scene takes a next breath, and everything begins to flow the other way. Time and tide, I find, are not the distinct words I always took them for. Time and tide wait for no man. Those two great forces, I always thought, time and the sea, the hours of the sun, the pull of the moon, the ineluctable powers of the heavens drawing movement from the earth. But no, tide in old English was time, with no thought of the sea. The expression began as a repetition of synonyms, two words for time, it tarrieth, they used to say, for no man. We have this older sense, the tidings of season and time, in yuletide, noontide. Tide came to take a sea sense probably in the 14th century, time was still its primary valence, the time of the waters. To me the earlier version of the expression almost seems to herald the coming differentiation – it is only when ‘tide’ has a sea meaning that the expression has its great breadth and completeness, its sense of mortality. 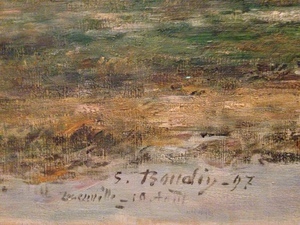 Boudin painted this picture in 1897, the year before he died. Looking at the details I am struck again by the way the figures, especially the one who bends to look at the water, seem to dissolve into the air.